Teachers: This applet generates examples where the y-intercept is an integer. The purpose of this applet is to formatively test students' knowledge of writing the equation of a line by mere observation. 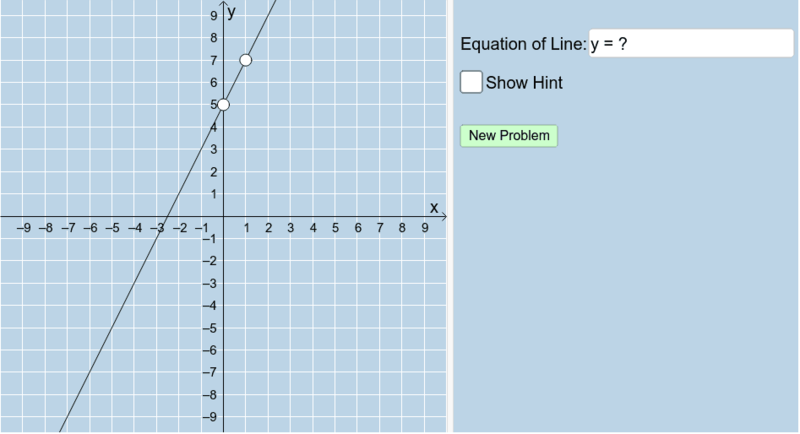 Students: For the line displayed, write the slope-intercept form of its equation in the input box below. For some problems, you may need to ZOOM OUT in order to see the black point on the line. If you enter this equation correctly, you'll see a big "CORRECT"! text appear. Repeat this exercise as many times as you need in order to master this concept!